The current tussle between the BCCI and NADA started in early 2017 when NADA requested that Indian cricket players be tested, as per their anti-doping regulations (discussed below) in all domestic competitions and international events. The BCCI, however, refused to let its players submit to the testing conducted by NADA, reasoning in a letter3 dated 8 November 2017, that they do not fall under the ambit of NADA. The BCCI also sent a similar letter4 to the Ministry of Youth Affairs and Sports (MYAS) on the same day. In the letter to NADA, the BCCI further emphasised that it has a zero-tolerance policy towards doping and follows “the highest professional and ethical standards laid down by the World Anti-Doping Policy (WADA) to ensure that the cricketers compete in a doping-free environment in India.” They justified their stance by claiming that they have adopted their own anti-doping rules i.e the BCCI Code5, which is in line with the WADA Code and it is in compliance with the mandates of conducting in-competition tests, out-of-competition tests and whereabouts requirements. The BCCI also stated that the collection of samples is done by an independent agency called the International Doping Tests and Management (IDTM)6 and the tests are conducted at WADA accredited laboratories. In the letter to the MYAS, the BCCI further went onto specify that it is not a National Sports Federation (NSF) but an autonomous organization affiliated to the International Cricket Council (ICC) and therefore not subject to the jurisdiction of NADA. They also enlisted the various provisions that they have adopted via the BCCI Code, in conformity with the ICC Anti-Doping Code7, the WADA Code and the Whereabouts Requirements for out-of-competition testing8. While NADA has made repeated requests to the BCCI to permit sample collection and testing, WADA also introduced the revised version of the International Standard for Code Compliance by Signatories, 20189 (ISCCS) in April, 2018 which lays down the sanction mechanism for non-compliant signatories of the WADA Code. In July 2018, the ICC was notified by WADA that it may face possible sanctions if the BCCI does not comply with the WADA Code, which in effect meant that the BCCI must submit to the jurisdiction of NADA. A deadline of 4 October 2018 was given to the ICC to ensure that all its member boards are compliant with the WADA Code. The BCCI, it seems, has defaulted on this compliance deadline and a case against the ICC has now been referred by WADA to the Compliance Review Committee10 (CRC), which is an independent WADA Standing Committee responsible for monitoring the compliance of the WADA Code by various stakeholders. The World Anti-Doping Agency (WADA), an initiative of the International Olympic Committee (IOC), is the international independent agency responsible for scientific research, education, development of anti-doping capacities and implementation of the World Anti-Doping Code11 (WADA Code - the core document that harmonizes anti-doping policies, rules and regulations within sport organizations and among public authorities around the world). Among others, one of the major roles that WADA performs is the monitoring of the compliance of the WADA Code by its signatories12. The WADA Code’s signatories include the Association of IOC Recognized International Sports Federations Members and National Anti-Doping Organisations (NADOs).13 NADA has adopted an anti-doping code that is in compliance with the WADA Code, called the NADA Code14. All national sports federations by the virtue of being affiliated with the international sports federations are mandated to be WADA Code compliant. The ICC is a member of the Association of IOC Recognized International Sports Federations and a signatory to the WADA Code.15 The BCCI is the governing body for the sport of cricket in India and affiliated with the ICC, which has adopted its own anti-doping code, which is on lines of the WADA Code, however not under the ambit of the NADA. The BCCI a National Sports Federation? The Ministry of Youth Affairs and Sports (MYAS) in India recognizes and lists16 the National Sports Federations (NSFs) for various sports, annually. The authority to function as an NSF depends upon its compliance with the National Sports Development Code of India, 201117 (NSDC) to ensure the transparency and accountability of the NSFs. In lieu of compliance with the NSDC, NSFs get grants and aids from the government, as well as earn the right to select and send the Indian national team for representation at international competitions. Any NSF, which is non-compliant to the NSDC, is not allowed to send national teams, use the word “India” in its name, not permitted to regulate and control the sport and is not granted any customs duty, income tax and foreign exchange exemptions, government quotas, subsidies and funding. The BCCI, as compared to other NSFs, has an unusual position in India. It is neither recognised by the MYAS as an NSF nor does it receive any funding, grants or subsidies. However, it is treated as the NSF for cricket in India, as it receives approvals from the government of India to hold international events in India and has the authority to participate in international events. The legal status of the BCCI was discussed a recent report published by the Law Commission of India.18 The report mainly dealt with the applicability of the Right to Information Act, 2005 to BCCI. The report also mentioned that the BCCI cannot be considered as "state" within the meaning of Article 12 of the Constitution but it does perform "public functions" owing to its monopolistic nature, the de facto recognition afforded to it by the government and the nature and character of functions performed by it. The BCCI is not in the strict sense an NSF but it does perform and undertake all activities of an NSF. The report also concluded that even though the BCCI has never applied for government funding, it has received ‘substantial financing’ from the government on the basis of the facts that it has received land at extremely subsidised rates and has also been granted concessions on customs duty and income tax. BCCI enjoys a monopoly status as regard regulation of the sport of cricket… It controls the sport of cricket and lays down the law therefor. It enjoys benefits by way of tax exemption and right to use stadia at nominal annual rent. It earns a huge revenue not only by selling tickets to the viewers but also selling right to exhibit films live on TV and broadcasting the same… Its full members are the State Associations except, Association of Indian Universities, Railway Sports Control Board and Services Sports Control Board. As a member of ICC, it represents the country in the international fora. It exercises enormous public functions. It has the authority to select players, umpires and officials to represent the country in the international fora. It exercises total control over the players, umpires and other officers... Its control over the sport of competitive cricket is deep, pervasive and complete. In the case of Zee Telefilms v. Union of India20, the Supreme Court of India discussed whether the BCCI is a "state" within the meaning of Article 12 of the Constitution of India. It was held that the BCCI is not a creation of a statute nor does it enjoy any financial assistance and its position in the game was not a state protected or state-conferred monopoly. The state had some control which is regulatory in nature, but not amounting to deep or pervasive control, nor was there financial, functional or administrative government control. However, it was held that while the BCCI is a private autonomous body, it performs some functions “akin” to public functions. So, in spite of performing a public function, the BCCI cannot be classified as a National Sports Federation and hence "state" under the Constitution of India. Therefore, the BCCI argues that is not an NSF and thus does not come under the ambit of NADA on the basis of the fact that it is not recognized by the MYAS. However, in the author’s view, the nature of functions performed by the BCCI appears same as those performed by other NSFs. It selects the national cricket team, it uses the word “India” in its name, and it is the monopolistic organisation for the control of cricket in India. Over and above all of these, it is recognised by the ICC as the sole governing body for cricket in India. 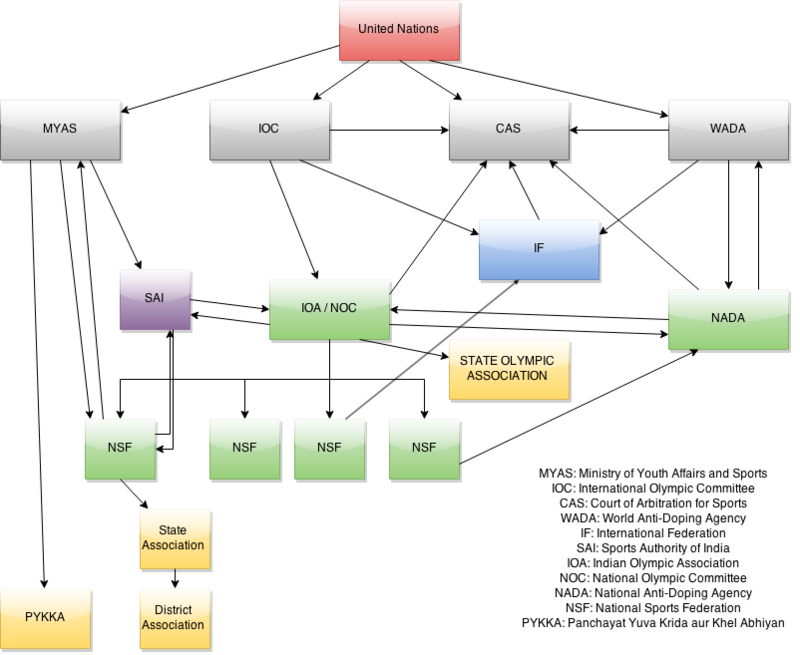 A mere reading of the NADA Code, wherein a NSF is defined as “a national or regional entity which is a member of or is recognised by an International Federation as the entity governing the International Federation’s sport in that nation or region”21 nullifies the BCCI’s argument as it is recognized by the ICC. Further, it is not necessary for a sports-governing body in India to be an NSF in order for WADA affiliated NADO to exercise its authority over it. A NADO has the primary authority to adopt and implement the anti-doping rules at the national level as per the WADA Code. It is important to note here that the term used in this Article is "National Federation in India" and not "National Sports Federations". Furthermore, the scope of the NADA Code is extended to not only athletes registered with National Sports Federations but also athletes who are registered with or accredited by any "National Federation in India". It is not a prerequisite that a "National Federation in India" is recognised by the government of India. The only pertinent fact is that the BCCI receives assistance from the government, as discussed above and it is also a body, which is recognised as the governing body by the international federation, i.e. the ICC. BCCI and the players registered under or accredited with the BCCI should hence come under the jurisdiction of NADA. The ICC full membership criterion states that the “governing bodies for cricket of a country, recognised by ICC” are the members. It does not mandate it being a national sports federation or any recognition from the central or state government for the governance of the sport. The BCCI by the virtue of being recognised by the ICC must come under the ambit of NADOs (NADA in India). The BCCI administers to itself an anti-doping programme independent of the NADA and the collection of samples is done by the Swedish agency IDTM, pursuant to a contractual relationship.22 The BCCI first entered into a contract with IDTM for 2010 edition of the Indian Premier League (“IPL”)23. The IDTM is a WADA approved agency, which provides anti-doping services for international federations, WADA, National Anti-Doping Organisations and independent sporting organisations and events.24 WADA had also taken the help of IDTM in releasing an Independent Observer Report earlier in 2003. Another reason for the BCCI’s refusal to come under the ambit of NADA is the "whereabouts" clause, introduced by WADA in 2009. WADA published the revised version of the International Standard for the Protection of Privacy and Personal Information (ISSPPPI)25 to ensure that organisations and persons involved in anti-doping in sport apply appropriate, sufficient and efficient privacy protections to personal data that they process. The ISSPPPI now mandates that all anti-doping organisations shall be able to demonstrate that their processing of personal information takes place in according to the standards mentioned therein and through the adoption of appropriate internal policies and procedures reflecting their adherence to the ISSPPPI26. The standards also bring about accountability and technical and organisational security measure, thereby factoring in the privacy concerns of the athletes. According to Article 5.6 of the WADA Code, an athlete, who is a part of the Registered Testing Pool (RTP) of either the international federation or a NADO, is warranted to provide to the national anti-doping organization their whereabouts for every single day, between 6 a.m. till 11 p.m. so that they can be reached out for any surprise drug test conducted on out of competition days. Here, the surprise test is supposed to act as a deterrent to the players to engage in any kind of prohibited activities. Moreover, it also increases the number of athletes caught by the agencies. This rule is not applied to every single athlete but only to a limited number of top-level athletes who are in the registered testing pool of either the International Federation or NADO as it is almost impossible to manage whereabouts of athletes worldwide. Any Failure to be present at the specified time on three occasions within twelve -month period results in anti-doping rule violation27 and the said athlete may be subjected to sanctions/punishment after considering the mitigating factors involved in any case. The BCCI Code provides for a soft/flexible whereabouts rule. Having said that, the procedure becomes convoluted because the ICC has another anti-doping code that resembles the one formulated by WADA and incorporates the whereabouts provision as is. The BCCI Code in its article on testing of athletes28 , more specifically in Article 5.3.2.1(a) provides that the ICC has the ability to establish an RTP and thus Indian players will be asked to provide their whereabouts. This rule, as it seems to the casual eye, recognizes that Indian players come under ICC jurisdiction if they’re part of the ICC testing pool. That said, Article 5.3.2.3 of the BCCI Code states that where a cricketer is part of both the testing pools, to prohibit any overlapping, the BCCI shall be the competent authority to receive whereabouts in such cases. Dissection of the above rule essentially means that the BCCI can have control over the whereabouts filings of a cricketer who has also been notified by the ICC as a part of its RTP and thus becomes capable of influencing the testing regime of the cricketers in India. Similarly, the matter of the ICC’s non-compliance with the WADA Code has now been referred to the CRC and if a settlement is not reached on the stalemate that exists between the BCCI and the ICC then the ICC may be in danger of facing sanctions from WADA as per the ISCCS.33 This could threaten the ICC’s grander ambition of having cricket included as an Olympic sport in the near future. The ICC has been a signatory to the WADA Code since July 2006,34 but the BCCI is not NADA Code compliant and claims that NADA does not follow the latest standards for testing the elite sportsmen and women, often quoting privacy of athletes being at threat due to the whereabouts clause. The other argument for the BCCI not subjecting itself to the jurisdiction of NADA is that owing to the special position of the BCCI as a governing body but not a National Sports Federation in the strict sense. the BCCI submitting to the jurisdiction of both NADA for sample collection and NDTL for testing of samples. In the event that BCCI continues to be reluctant to come under the ambit of NADA, then BCCI and WADA may come to an agreement and get the sample collection by any agency, and testing done by any laboratory, that WADA suggests. While the BCCI may be financially capable of getting its samples collected independently, however, it does not give it the authority to have its cake and eat it too, wherein it chooses to not submit to the jurisdiction of one government agency, i.e. NADA, but gets its testing done by another government-funded agency, i.e. NDTL. To conclude, Indian cricketers who may be a part of the RTP, are no different from any other elite athletes, therefore, BCCI’s concerns regarding the privacy of its top-level players are baseless since the ISSPPPI code, which all authorities under WADA are subject to, is sufficient to combat all the issues in that regard. 1 One Indian Cricketer Tested Positive: 2016 WADA Report, https://timesofindia.indiatimes.com/sports/cricket/news/one-indian-cricketer-tested-positive-2016-wada-report/articleshow/61250869.cms (last accessed on January 18, 2019). 5The Board of Control for Cricket in India, Anti-Doping Rules https://relaunch-live.s3.amazonaws.com/cms/documents/5a054823df692-BCCI Anti-Doping Code 2017.pdf (last accessed on January 19, 2019). 6 International Doping Tests and Management, https://idtm.se/ last accessed on January 18, 2019. 7 ICC Anti-Doping Code, https://www.icc-cricket.com/about/integrity/anti-doping/code (last accessed on January 18, 2019). 8 Article 5.2 and Article 5.3, BCCI Code. 9 International Standard for Code Compliance by Signatories, 2018, https://www.wada-ama.org/sites/default/files/resources/files/isccs_april_2018_0.pdf (last accessed on January 18, 2019). 12 WADA Code Signatories, https://www.wada-ama.org/en/what-we-do/the-code/code-signatories (last accessed on January 18, 2019). 14 The National Anti-Doping Rules, National Anti-Doping Agency, India https://www.nadaindia.org/upload_file/document/1493557039.pdf (last accessed at January 18, 2019). 15 WADA Code Signatories, available at https://www.wada-ama.org/en/what-we-do/the-code/code-signatories, last accessed on 18 December 2018. 16 Available at https://yas.nic.in/sites/default/files/updated final recognised list 2018%2803.12.2018%29.pdf, last accessed on January 19, 2019. 7. Availability of required infrastructure. 18 Legal Framework: BCCI vis-à-vis Right to Information Act, 2005, April, 2018, https://lawcommissionofindia.nic.in/reports/Report275.pdf (Last accessed on January 18, 2019). 19 (2005) 4 SCC 741. Paras 80-82. 20 (2005) 4 SCC 649. 21 National Anti-Doping Agency Anti-Doping Rules, 2015, Appendix 1: Definitions, at page 84. 22 Tussle between BCCI and NADA could hurt Indian sport in general, November 22, 2017, available at https://economictimes.indiatimes.com/blogs/et-commentary/tussle-between-bcci-and-nada-could-hurt-indian-sport-in-general/, last accessed on 18 December 2018 . 23 Follows Transparent Dope Testing Procedure, says BCCI, Neeru Bhatia, May 29, 2017, available at https://www.theweek.in/content/archival/news/sports/follows-transparent-dope-testing-procedure-bcci.html (last accessed on January 19, 2019). 25 Available at https://www.wada-ama.org/sites/default/files/resources/files/ispppi-_final_-_en.pdf, last accessed on January 19, 2019. 27 Clause 2.4, WADA Code. 28 Article 5 – Testing, available at https://www.bcci.tv/about/2018/anti-doping/67/article-5-testing, last accessed on January 19, 2019. 29 Anti-Doping: CoA Shies from Debate, K Srinivas Rao, October 17, 2018, https://timesofindia.indiatimes.com/sports/cricket/news/anti-doping-coa-shies-from-debate/articleshow/66254876.cms (Last accessed on January 19, 2019). 30 Clause 11.1.1.3 of the ISCCS. 31 Clause 11.1.1.11 of the ISCCS. 32 WADA Foundation Board approves wide-ranging governance reform, November 15, 2018, available at https://www.wada-ama.org/en/media/news/2018-11/wada-foundation-board-approves-wide-ranging-governance-reform, last accessed on 18 December 2018 . 33 Article 11, Determining Signatory Consequences, ISCCS. 34 Available at https://www.icc-cricket.com/about/integrity/anti-doping/code, last accessed on January 24, 2019. The issue is not whether BCCI has money to conduct tests or to pick the best lab in the world. It is a question of submitting itself to the jurisdiction of the NADA (NADO India) as per the WADA Code and as per the ICC anti-doping code. The ICC has given a special status to the BCCI, that the latter need not be under the authority of the NADA. This is in breach of the Code. This is what WADA has taken up with ICC. Cricket simply cannot be considered Code-compliant, should be declared so by Compliance Committee and consequences should follow. The WADA Code compliance procedures have nothing to do with any understanding that BCCI might have with NADA or Govt. The International Federations and NADOs and Major Event Organizations are signatories to the Code and not National Federations like BCCI. WADA deals with them and not NFs. The disciplinary process has to be against these bodies if and when compliance is not met even after warnings. ICC has in the past been penalized for non-compliance. WADA cannot allow a particular National Federation in a sport to have a system of its own, outside the rules laid down in the Code and its International Standards. Thus allowing the BCCI to pick its lab, to manage its disciplinary procedures etc are irrelevant and will be in violation of the Code. Any agency collecting samples on behalf of an anti-doping authority is doing just that, collect samples. It doesn't have either the authority to decide who should be tested or which tournament should be under doping control. It also does not have the authority to conduct 'results management' beyond the initial processes. Sanctions are solely the prerogative of the Testing Authority, in this case BCCI, which should be the NADA if rules are followed. BCCI's refusal to join the mainstream is based on the mistaken notion that the privacy of the players would be intruded into. Dope-testing is intrusive; whereabouts testing more so. If professional tennis, golf and football players can be brought under the ambit of testing by authorized agencies there is no room for any exception to cricket or only to Indian cricketers. Financial clout of the BCCI should not mean it can frame its own anti-doping rules and refuse to come under NADA. If the Government of India becomes stricter and enforces anti-doping rules as accepted by NADA and as required to be followed under UNESCO Convention, this posturing by BCCI would vanish. For that the Sports Ministry has to accept that compliance to the NADA rules is a necessity dictated by the Code and not a convenience as per the financial position of a particular National Federation or its willingness to test in accredited labs.